Recognition of the need to actively manage the business risk of the loss of key people. 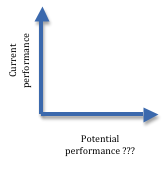 A generic model to which OCS subscribes is assessment of people against a matrix of current performance and potential performance, as per the below diagram. When assessing current performance, there is a fair amount of readily available data to enable a reasonably objective judgment. We have performance appraisal information, salary review data and various other data on organisational performance. Practices for assessing potential, in our experience, tend to be much less objective. In the absence of more robust methods, opinion based on experience with the individual becomes the basis for the judgment. This process tends to ignore the Peter Principle, where people are promoted one level beyond their level of competence. That’s not to say all these judgments are wrong, but they are based on a flawed methodology. If more objective tools could be found to assess potential, the quality of the talent assessment would be significantly enhanced. OCS and an associate have developed such tools. If you want to improve the objectivity of your talent assessment process, contact us via the contact details below.